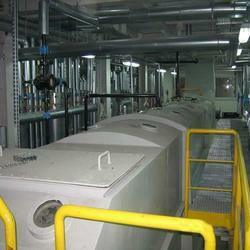 We are engaged in providing reliable and qualitative range of solvent extraction plants. Provision of special cooling system to help to produce final oil at 10-15°C above the ambient temperature, which will prevent oxidation and colour fixation of the oil. Our company offers Solvent Extraction Plant that are conform to the highest international standards of safety and quality control. These plants are technically fabricated and installed so that they decrease the risks of environmental pollution and the associated costs, penalties and negative publicity. Extractor is provided with material bed adjusting arrangement for adjusting of bed height as per capacity of plants. We offer these plants at most competitive prices. Extractor has single piece Hollow shaft gear box having out put of 0.05 rpm, which is mounted on the extractor main shaft. This is excellence of engineering that avoids the use of Big Gear and pinion arrangement prone to frequent maintenance. Extractor Motor is driven by Variable frequency drive that allows finite adjustment of speed as per processing rates and also allows the data-logging like Run time, stoppage history etc. Extractor has Single piece miscella hoppers having no joint. 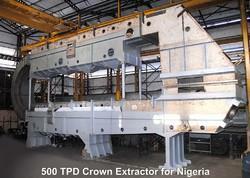 This reduces the welding and chances of leakage during operations. All body plates and internals are sandblasted and Zink base epoxy primer coated prior to manufacture. This increase life by reducing chances of corrosion and increases life of equipment. 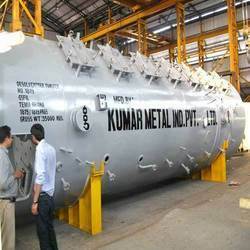 Extractor is fabricated in factory, ( site fabrication is avoided) and running trial is taken in factory to ensure trouble free running at site. Prefabrication reduces the time for erection and plant will be started quickly. Selection of size - is such that the bed height is limited to 1.5m which reduces the chances of miscall channelling. Rate of mark feeding to DT is consistent. Which ensures consistence vapour flow and control on hexane loss. Loading of extractor Bed is low, i.e. weight per square m is low compared to true deep bed extractors which ensures low wear and tear of band conveyor, ensuring long life. Extra miscella hopper at discharge end to allow more hexane to drain before it is fed to DT, hence load on DT is low ensuring low steam consumption to evaporate Hexane and low water circulation for condensation as well. Extra miscall hopper at feed end to ensure the settling of miscella before it is transferred to Miscella tank. Major fines are settled in this hoppers which are then pumped on the top of extractor. The additional miscella spray of this hopper is used to soak the incoming Flakes so that the regular miscella circulation sprays are used effectively. Crown Extractor Model III 703 M manufactured under Crown supervision at our workshop in Mumbai. 1. Crown hydro clones for Effective separation of fines from miscella. 6. All gear boxes of SEW Euro drive of European Orign. The suction load data of each steam jet ejector is precisely calculated which ensures lowest possible consumption of steam, thus reduction in recurring expenses along with reduction in heat load on condensation system. Distillation is carried out in three stages of vacuum. There by achieving incremental concentration of miscella at predetermined rate. Further more each stage is differentiated by incorporation of precisely designed U type siphon pipe, eliminating the use of centrifugal pump. This ensures continuous flow of miscella, & reduces power consumption. Economizer is specially designed having built in flasher, which provides the compact design, Minimum plant space and reduction in unwanted piping. This design itself provides the high efficiency flashing which increase the miscella concentration up to 75%. The final stage striping is carried out in presence of steam under higher vacuum of 700 mmHg. This allows the lower temperature distillation and they’re by ensuring undamaged crude oil without color fixation. 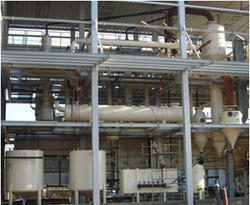 Looking for Solvent Extraction Plant ?